On May 15, 2015, typhoon Dolphin blew through the Marianas, ironically for Guam’s most endangered tree, the storm made landfall on Endangered Species Day. 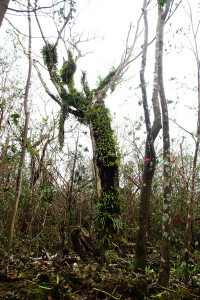 Håyun lågu or trongkon guåfi are the Chamorro names for Serianthes nelsonii, a beautiful tree endemic to the islands of Guam and Rota with only one mature tree still standing on Guam. The Guam Plant Extinction Prevention Program (GPEPP) at the University of Guam had boots on the ground assessing the damage to the Serianthes mother tree after the storm. While many wondered when their power and water would be restored, the people at GPEPP were wondering whether their trees had survived the damaging winds. The GPEPP crew was at work over the weekend to tend the håyun lågu seedlings and other rare plant species in their nursery on the UOG campus as well as check the status of the outplanted Serianthes seedlings with the U.S. Fish and Wildlife Service’s Guam National Wildlife Refuge. Dana Lujan, Conservation Resources Chief with Andersen AFB is working with GPEPP, the Wildlife refuge and US Fish & Wildlife in coordinating seed collection and monitoring of the mother tree. He was the first to assess the damage to the tree after the storm. 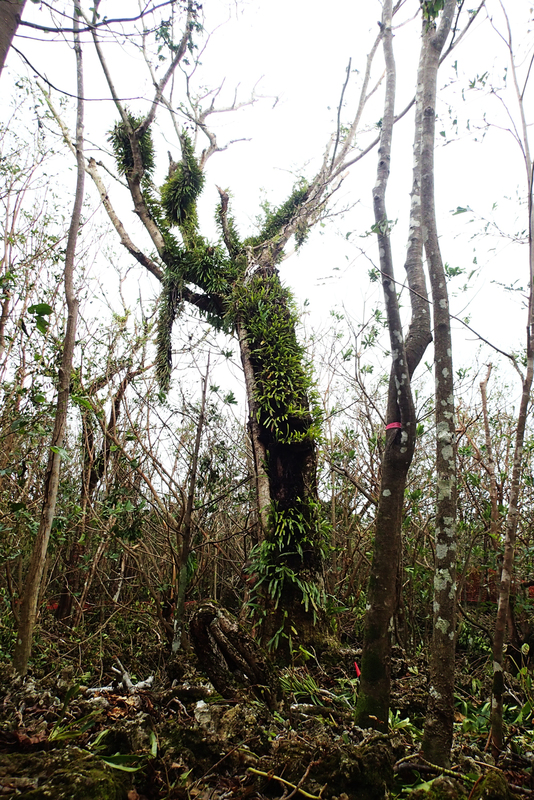 “Seeing the mother tree still standing tall in a typhoon damaged forest was a relief. Although the mother tree was not blown down, many branches were broken off by the wind. The sad part is that they had many flowers that would have most probably produced much needed seeds,” said GPEPP project coordinator Else Demeulenaere. GPEPP, U.S. Fish and Wildlife Service’s Guam National Wildlife Refuge, U.S. Fish Wildlife Service’s Ecological Services Field Office, and Guam Department of Agriculture Forestry & Soil Resources Division recently outplanted 36 håyun låguseedlings in the natural limestone habitat at the U.S. Fish and Wildlife Service’s Guam National Wildlife Refuge at Ritidian. GPEPP personnel assist refuge personnel in monitoring these seedlings, and they seem to have weathered typhoon Dolphin well. U.S. Fish and Wildlife Service’s Guam National Wildlife Refuge reported that none of the seedlings were damaged during the storm. The University of Guam, College of Natural and Applied Sciences, home of GPEPP, continues to sustain and protect Guam’s agriculture and natural resources. For more information about the Guam Plant Extinction Prevention Program please contact Else Demeulenaere or Jim McConnell at 735-2129 or visit our website gpepp.org.